HomeGovernmentTURMOIL IN THE TRUMP ADMINISTRATION: WILL TRUMP FIRE AG JEFF SESSIONS? TURMOIL IN THE TRUMP ADMINISTRATION: WILL TRUMP FIRE AG JEFF SESSIONS? As of right now, all we have are a few of Donald Trump’s Tweets and a report saying he “discussed” the firing of Attorney General Jeff Sessions. Sessions has been under fire since last week, (and basically since he became the attorney general because of his tyrannical stance on marijuana) when Trump leveled harsh criticisms in a New York Times interview. Trump called Sessions’ recusal “very unfair to the president” and adding that he would never have appointed him attorney general had he known he would do so. Sessions, though, said he would stay where he’s at, much to the disdain of freedom lovers everywhere. Later, White House Press Secretary Sarah Huckabee Sanders told reporters that the president “clearly has confidence in him or he would not be attorney general.” But it sure doesn’t seem like all is well in paradise. he president unleashed a battery of tweets berating Sessions for the absence of an investigation into Clinton’s connections to Ukraine and Russia. The media has been almost silent on the wrongdoings of Hillary Clinton while directing the focus onto Trump. The suspicion is that they have been, and will continue to cover for Democrats. 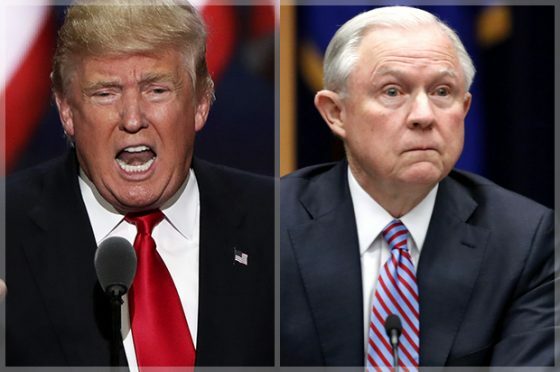 But in the meantime, Trump’s problem with his attorney general is not the freedom trampling mentality Sessions displays daily, but his unwillingness to investigate Hillary Clinton and the corrupt democrats. But who can blame Sessions. He’s focused on violently prosecuting those who use medical marijuana, not on Hillary Clinton. Department of Justice officials told Fox News that Sessions is in “good spirits.” Trump’s intensifying criticism has fueled speculation that Sessions may resign even if Trump opts not to fire him. During an event at the White House, Trump ignored a shouted question about whether Sessions should step down. According to Fox News, Newt Gingrich, a frequent Trump adviser, said that the president, with his criticisms of Sessions, was simply venting and being “honest about his feelings. But that doesn’t mean he’s going to do anything,” Gingrich said. Still, he said the president’s comments would have repercussions when it comes to staff morale. “Anybody who is good at team building would suggest to the president that attacking members of your team rattles the whole team,” Gingrich said. Yet it can be argued that Sessions should be attacked. His fascist stance on marijuana puts many otherwise peaceful people at risk of violence for using a plant in a manner they see fit. Save The People… Read The Sheeple! Join over one million free thinkers who read our newsletter monthly. Stay up to date with breaking news, trending videos and important information sent to you a few times a week. Privacy Assured: We will never share your email address.